I really enjoy attending seminars and learning about the latest forecasts in color & design. Recently I attended a webinar on “Colors for 2013”. RED: We are supposed to see a deep sophisticated red in 2013 that is influenced by blue & quite often ‘blackened’. There will also be some red-orange paired with hot pink! YELLOW: The new yellows will be golden & acidic. Think citrus yellows paired with purple or grey. Different huh?! BLUE: The new blue will be a range of navys to muted blue grey. We’ll see more turquoise & teals too. There will also be more periwinkles. PURPLE: Purple will be muted paired with yellow & neutrals. There will be a very muted berry version mixed with “Fuchsias”. NUETRALS: We always have our neutrals, but they are getting more complex, which I find very exciting. There are more undertones that are going to appear. They will be mixing warm & cool for a layered look. Lots of influence from reclaimed wood will be found in our taupes & grays. And once again the cosmetic tones will play a part in the new neutral pallet. As we know neutrals never go away-they are a constant but if we had to choose one of the above colors that is going to linger…they say it will be Purple! I have an aunt who will be very excited to hear this! 😉 Actually I’ve been drawn to purples a lot lately and I’m seeing in used a lot more in children’s spaces. 5. Color (Animation, Vibrant, Playful). About 10 years ago, the word ‘eclectic’ was on the tip of everyone’s tongue. It described what was supposed to be a “collected” look…before long it was the go-to description by everyone who didn’t know what style their home was. Then, I’d say for the last 5 years, a new interior descriptive word has crept in-that word is “transitional”. Have you heard that one? Have you used it to describe your own home? Transitional meant clean traditional lines, but without the ornate fussiness. It also allowed us to weave in different style categories as the transitional selections became very neutral & acted as almost a back drop to display different unique items. So what is next? Well, the ‘blend’ certainly hasn’t gone away, that’s for sure! Now we call it “intersections”. Weaving various styles sometimes with a blunt balance (what I call the mullet of interior design) and sometimes the blend is smooth (which is what I personally prefer). 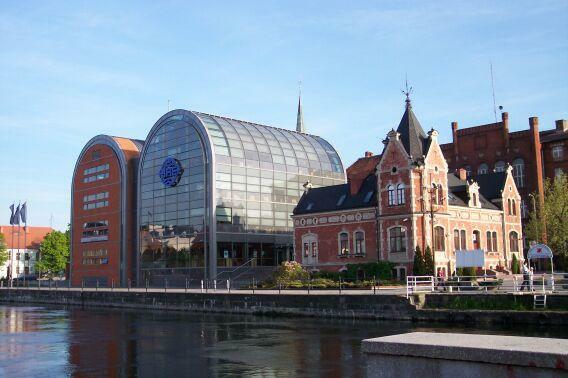 Fine examples of modern and old architecture in Bydgoszcz, Poland. People are being more mindful about using what they have & repurposing. You may have heard the new term “up-cycle”. Up-cycle refers to taking useless items and reusing them for a greater purpose. With virtual worlds like, Facebook & Pintrest growing, people are sharing and networking more DIY ideas. I think this is helping the “handcrafted movement” to come back. I’m seeing it everywhere. Items that were formerly discouraged from remaining in a room are making their way back. People have attachments to things that are created or uniquely handcrafted, especially items from family and friends. So, use that old blanket Grandma spent hours making, let it be an accent in your living room! Another great way to weave some of these handmade items into your space, (if you are still uncomfortable with how they will translate) is to custom frame them. You’ll be surprised how the right design can compliment a handmade doily while transposing it into your space. How do you do this? By selecting matting that works with the doily, but finding a moulding/frame that works with your space. This concept applies to all accents. Say you have your child’s first piece of pottery; find additional pieces that harmonize with the colors in the pottery surrounding it with a common denominator but perhaps a different shape that is conducive to your space. It will look like it belongs. Do you feel you struggle with the details of color selection & accent placement? Give us a call-we are always happy to help!